Brainiacs is honored to have been nominated and win runner up for BEST of Loudoun in Educational Enrichment! We are so thnakful to all of our customers who voted and are very excited about the welcoming response of our Lovettsville Community! We have some great things planned for 2019 and we hope to continue to win the hearts of our customers! Thank you to Washington Exec for the great article about all the new and exciting things happening at Brainiacs! Learn about our misson and what is on the horizon for 2019! https://www.brainiacs-stem.com/wp-content/uploads/2018/05/brainiacs-logo.png 0 0 Megan Ratner https://www.brainiacs-stem.com/wp-content/uploads/2018/05/brainiacs-logo.png Megan Ratner2019-01-03 12:16:062019-01-03 12:17:32Hot off the Press! Brainiacs was nominated for Best of Loudoun 2019! We are honored to be nominated for the best educational enrichment center! We thank all of our loyal customers who have nominated us and we thank everyone that continues to vote! Blue Ridge Leader Calls Us Nerds! Brainiacs is in the news again! Thanks to Andrea Gaines for writing a great article for the Blue Ridge Leader. Check out “Brainiacs – Where Being a Nerd is Fun.” It is true, we are always having fun here! https://www.brainiacs-stem.com/wp-content/uploads/2018/05/brainiacs-logo.png 0 0 Jill Kurtz https://www.brainiacs-stem.com/wp-content/uploads/2018/05/brainiacs-logo.png Jill Kurtz2018-09-14 19:36:532018-10-01 08:33:03Blue Ridge Leader Calls Us Nerds! 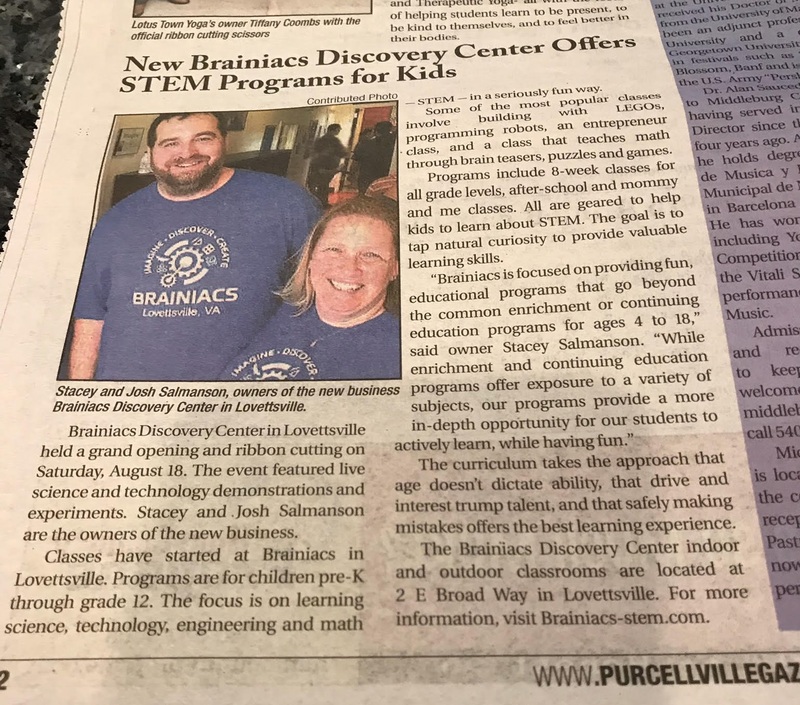 This week’s Purceville Gazette features the grand opening of the Brainiacs STEM discover center in Lovettsville. We’re off to a great start with classes and an after-school program. If you haven’t stopped by, come and see all the fun were having as we learn about science, technology, engineering, math and more! Loudoun Times Features our STEM Discovery Center! Karen Graham of the Loudoun Times recently visit to check out Brainiacs! See her article, Local couple launches Brainiacs in Lovettsville. https://www.brainiacs-stem.com/wp-content/uploads/2018/05/brainiacs-logo.png 0 0 Jill Kurtz https://www.brainiacs-stem.com/wp-content/uploads/2018/05/brainiacs-logo.png Jill Kurtz2018-09-10 08:09:192018-09-10 08:09:19Loudoun Times Features our STEM Discovery Center! We are having a great time sharing the fun of learning with all of the kids! Research shows girls are as good as boys at math but the way they are traditionally taught doesn’t favor them realizing that. Practice is as important to math competence as it would be to playing a musical instrument. These are core concepts that align with Brainiacs “seriously fun” approach to teaching style for kid’s to “discover” STEM.